In the midst of clean urban architecture and the beautifully maintained gardens of Singapore, one doesn’t expect to find any place that is totally wild, unkempt and peaceful. And yet such a place exists, right at the center of Singapore! 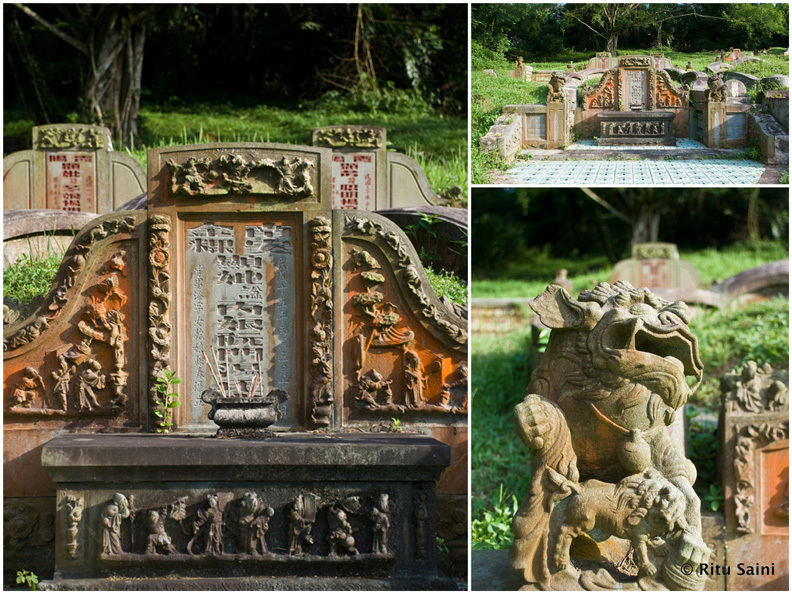 Bukit Brown cemetery, in the heart of Singapore is an abandoned Chinese cemetery where the trees and shrubs have been left to grow unrestricted around the beautifully decorated traditional Chinese graves. It’s quite fascinating and although not as dramatic but it reminded me of the temple ruins from Cambodia. It’s like witnessing the history of Singapore in the middle of a lush green tropical forest where all that one can hear are the chirping of birds and the hustling of leaves. Bukit means a hill in Malay and the cemetery was named after its first owner, George Henry Brown, a ship owner who had arrived in Singapore from Calcutta in the 1840s. 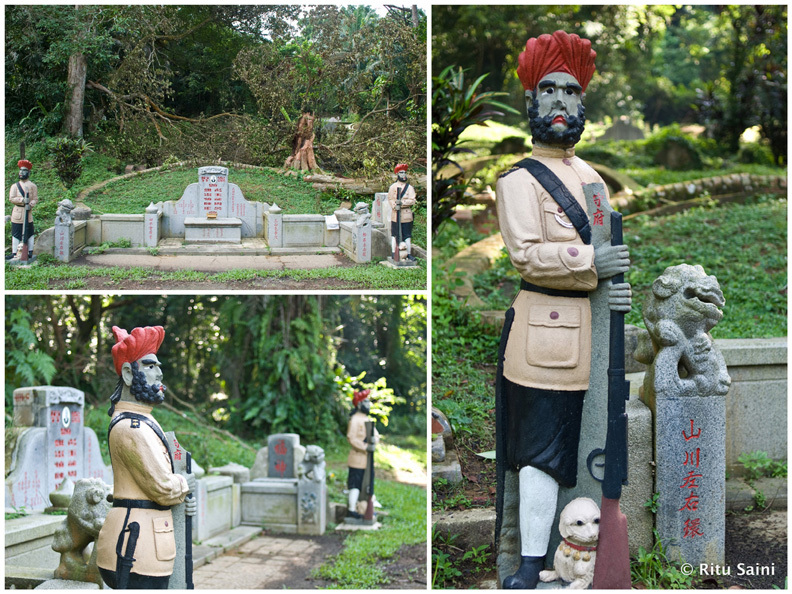 Also known as Kopi Sua or Coffee Hill by the local community probably due to the coffee plantations at Mount Pleasant, Bukit Brown was established on 1st January 1922 and managed by the municipal authorities as a public burial ground for the Chinese communities in Singapore. 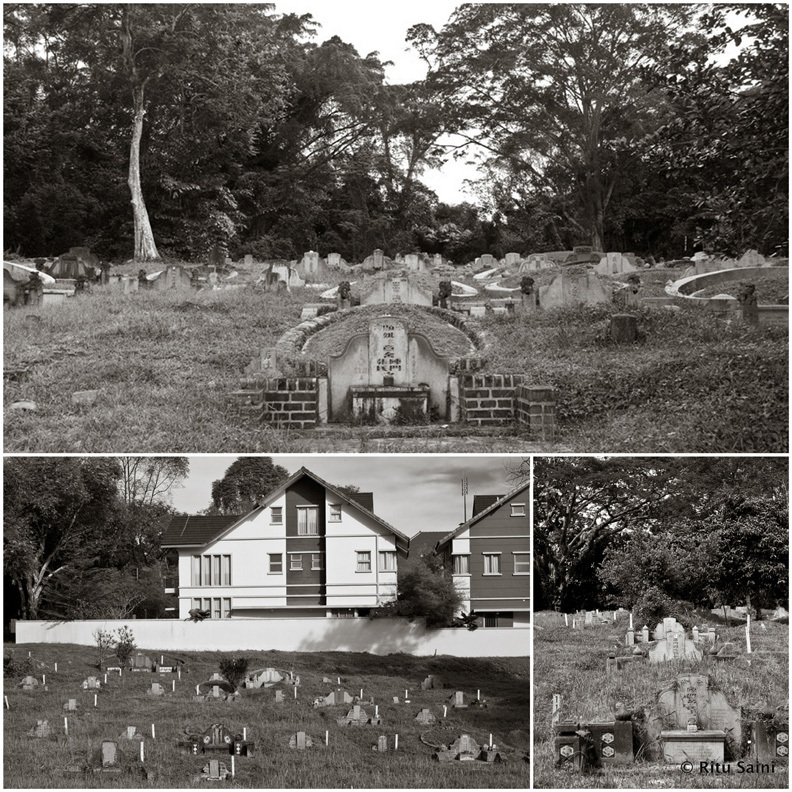 There are more than 100,000 graves in an area of about 233 acres at the cemetery, which is situated between Lornie Road and Mount Pleasant Road; one of the most beautiful roads for a drive in Singapore. In 1970s the cemetery was closed and is now home to many bird and wild life species, some of which are endangered. It’s popular among nature lovers and great for a stroll in a peaceful setting. There are lots of people who walk their dogs, jog and do horse riding here. Bukit Brown has immense historical importance as many famous and prominent Singaporean pioneers lay buried there including Mrs. Eu Kong, mother of Eu Tong Sen (Eu Tong Sen Road was named after him); Loh Kye Wee, director of Malaya Broadcasting Co.; Tan Lark Sye, philanthropist and co-founder of Nanyang University; Ong Sam Leong, renowned entrepreneur; Ong Boon Tat, proprietor of New World Park; Chew Joo Chiat (Joo Chiat estate); Mrs Lim Nee Soon, Lim Chong Pang, which Chong Pang village was named after; and Chew Boon Lay of Boon Lay estate. 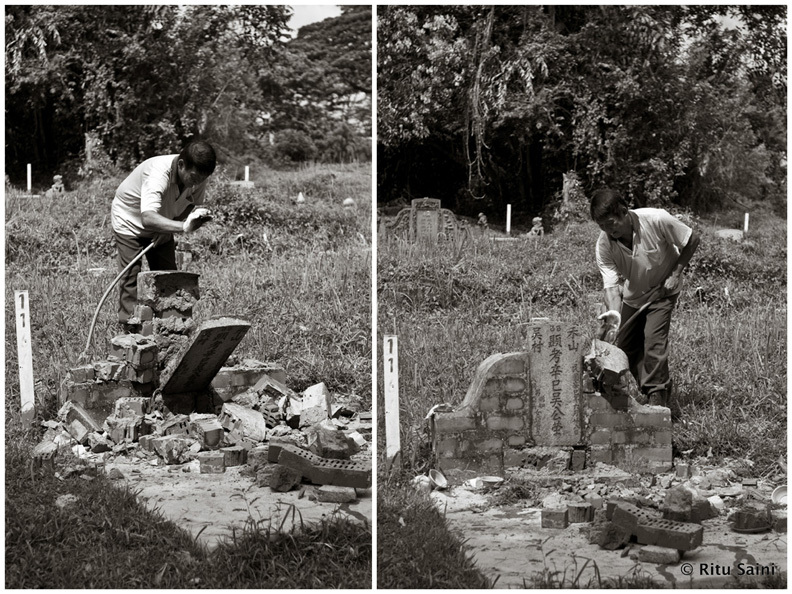 Due to the problem of land scarcity in Singapore, a lot of former cemeteries and burial grounds were cleared to make way for urban development. It’s Bukit Brown’s turn now, as the Land Transport Authority (LTA) of Singapore has finalized the plans for a new road across the cemetery. A part of the cemetery will be affected to build the dual four-lane road and LTA will undertake the exhumation of the affected graves. Only the graves marked on a white stake with a serial number are to be exhumed. Bukit Brown MRT station (part of Circle Line) has already been built and will open when the surrounding area develops. 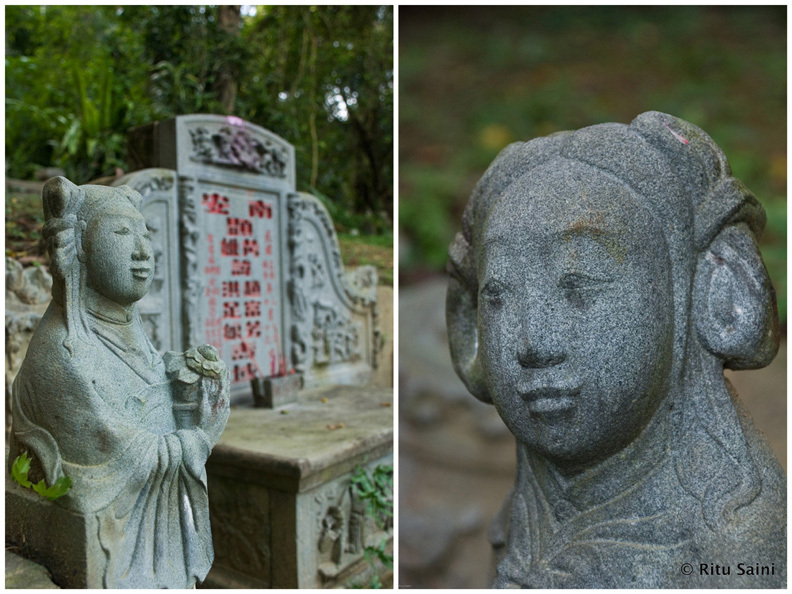 Chinese cemeteries are generally on hillsides since this is thought to improve Fengshui. The tombs are decorated and carved beautifully with mythical beings and sculptures, which are believed to have protective powers and guard the grave. 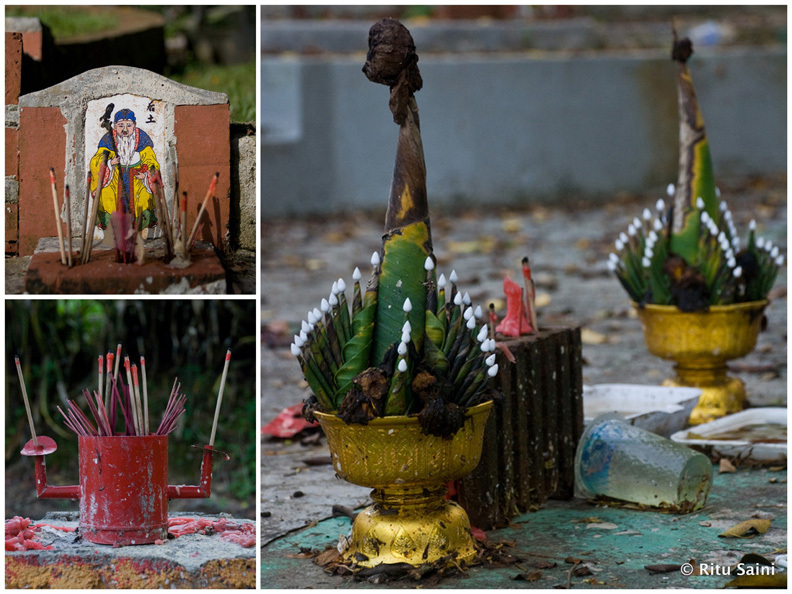 There are still fresh offerings and burnt incense sticks on some of the graves. The graves and tombstones are like pieces of art adorned with murals, sculptures, painted ceramic tiles and photos of the deceased. 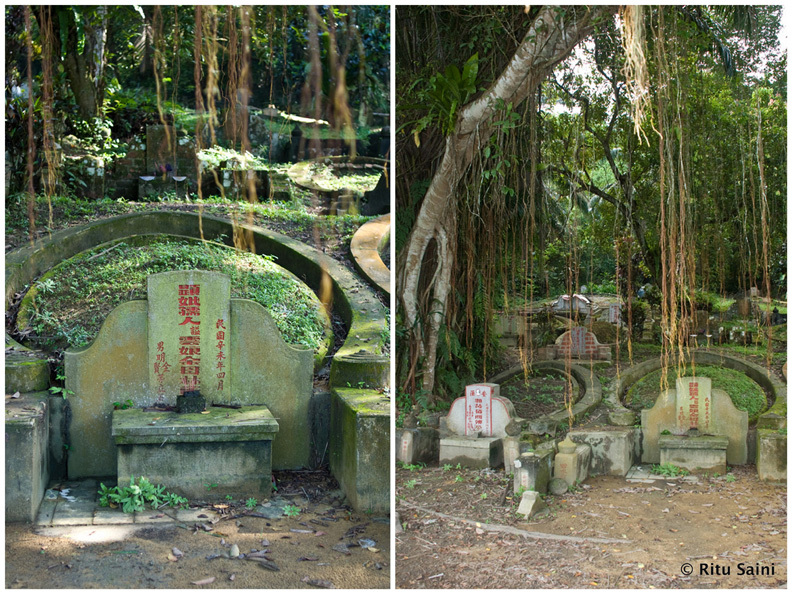 Most of the graves are covered with moss and has plants growing all around them. 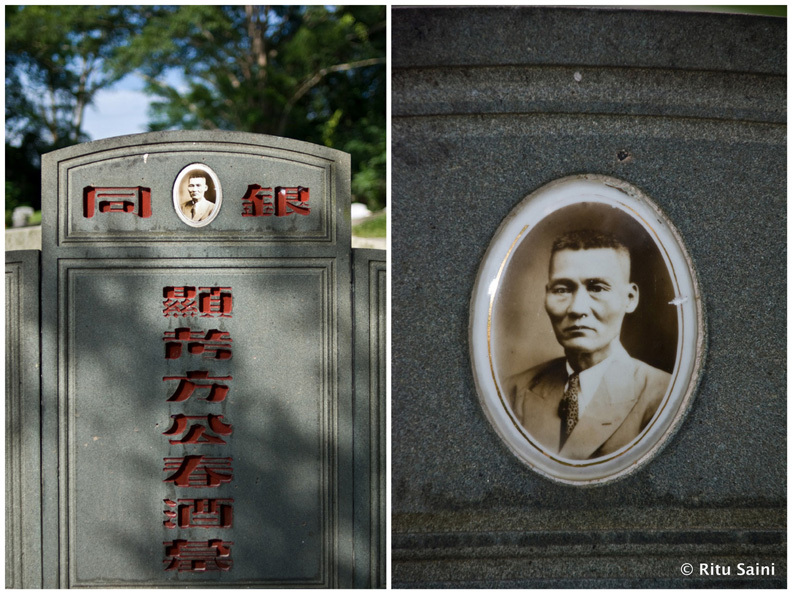 The sepia-toned photos on the tombstones are like memoirs of the past, and each one of them tells a story. 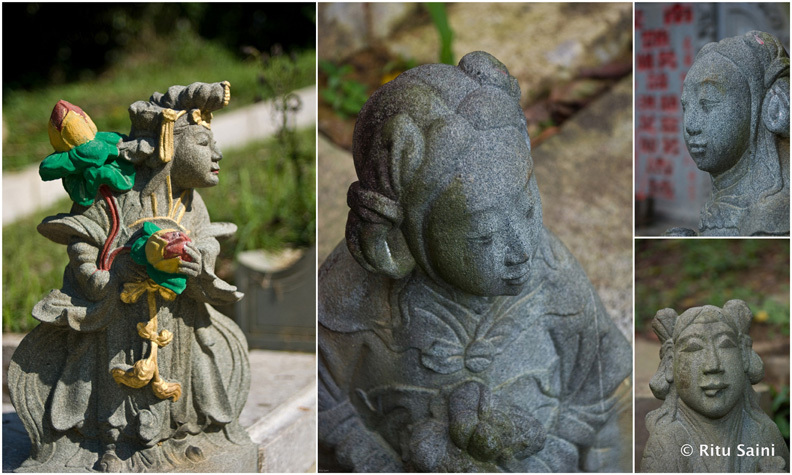 There is a strange calmness in the photos as there is at the cemetery. A feeling of sadness and spirituality filled my heart looking at the graves, and I wish they are preserved and maintained as a precious remembrance of Singapore’s heritage and history, which can never be forgotten. 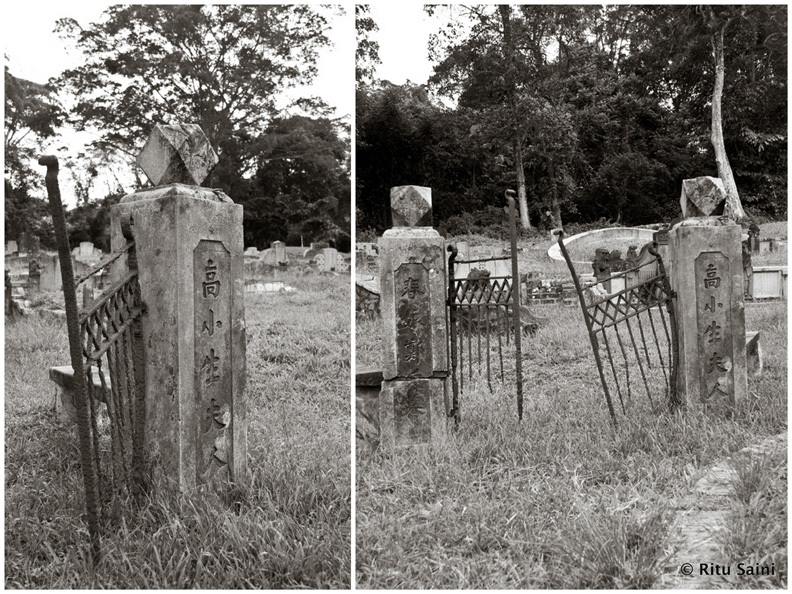 Here’s a short film The Forgotten by Phillip Adam shot at Bukit Brown cemetery. 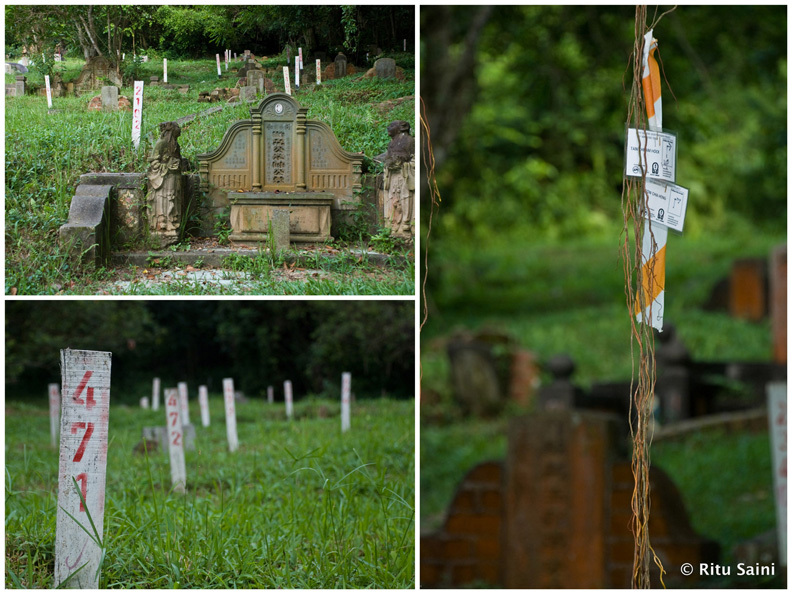 More information about Bukit Brown Cemetery is here, a Facebook page and a Facebook group about the cemetery and a Blog by Raymond Goh. Records of the burial registers from April 1922 to December 1972, in chronological order are here. 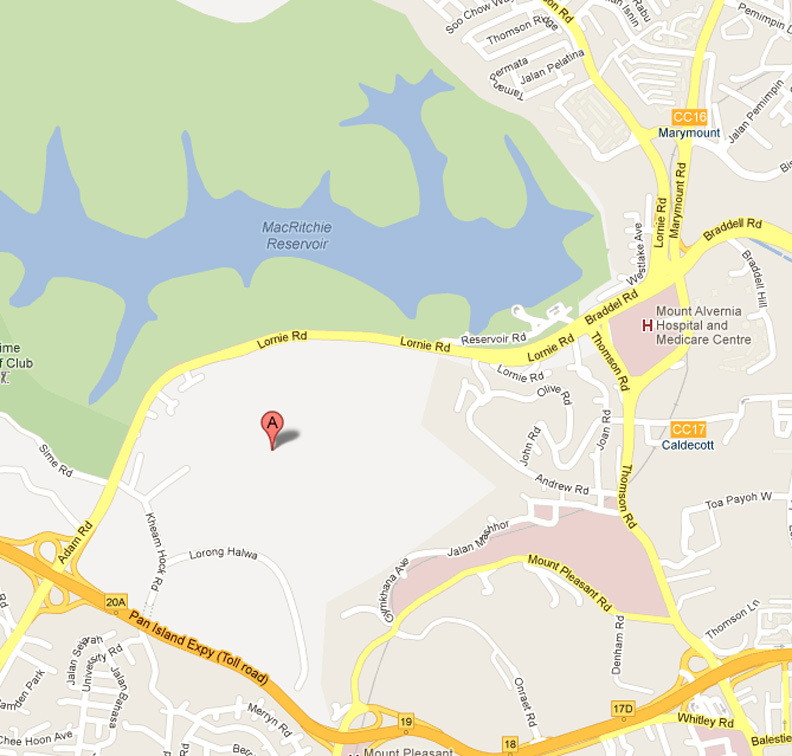 Getting to Bukit Brown Cemetery : The cemetery is on Lornie Road, off Sime road and Kheam Lock road near Mac Ritchie Reservoir. Botanic Gardens, Caldecott and Marymount MRT stations on the Circle line are closest to the site. Please refer to map below. P.S. Please carry mosquito repellant and water if you plan to explore the area. Thanks Ritu for bringing this interesting place to my attention, it is so close to my home, and I’ve seen snippets of it from the road but never knew it’s name or it’s size. How terrible that they will have to destroy some of the cemetery. I will definitely be taking a walk there with my husband; always looking for new spots to visit. Cath. Yeah! It’s quite heart-breaking, but not all the graves will be destroyed, and the area will be developed as a Heritage site in the future. It’s a great peaceful and green place! That’s good to know, and yes, I will enjoy it! Cath. 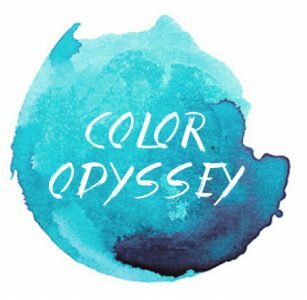 Thanks for your blogpost, Ritu! 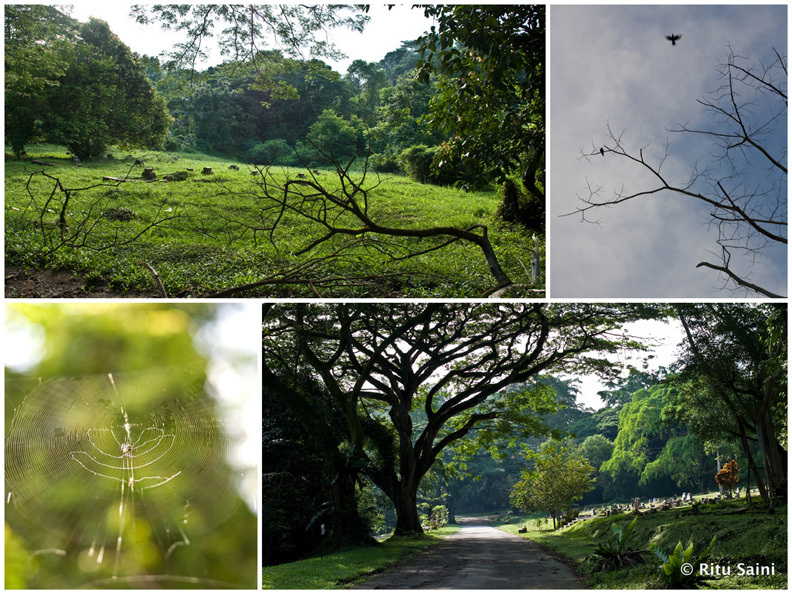 If you see the value of Bukit Brown and would like to save it for future generations, please join the thousands in the campaign to Save Bukit Brown 100%. 1) Like the SOS Bukit Brown page: http://www.facebook.com/sosbukitbrown. These 2 numbers reflect the ground sentiments, translate into the concerns and strong interest about Bukit Brown and why it is a popular and pragmatic to save our environment. I am a fan of cemeteries, period! They do tell the history of a place. 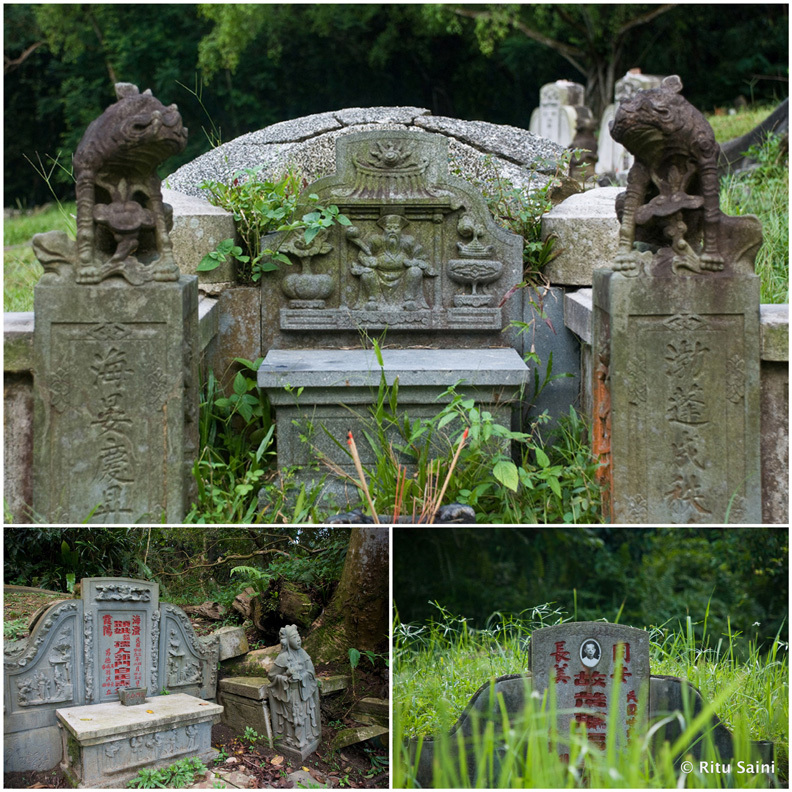 When special cultural elements are included, such as these Chinese graves, they feed my imagination about the people buried there. I too feel a sense of peace in cemeteries and some think I’m weird because of that. Those people don’t appreciate what cemeteries really stand for — the history, and also a reminder of those who came before us and achieved much, however small or large that contribution may have been. The garden setting makes for a beautiful contemplative place. 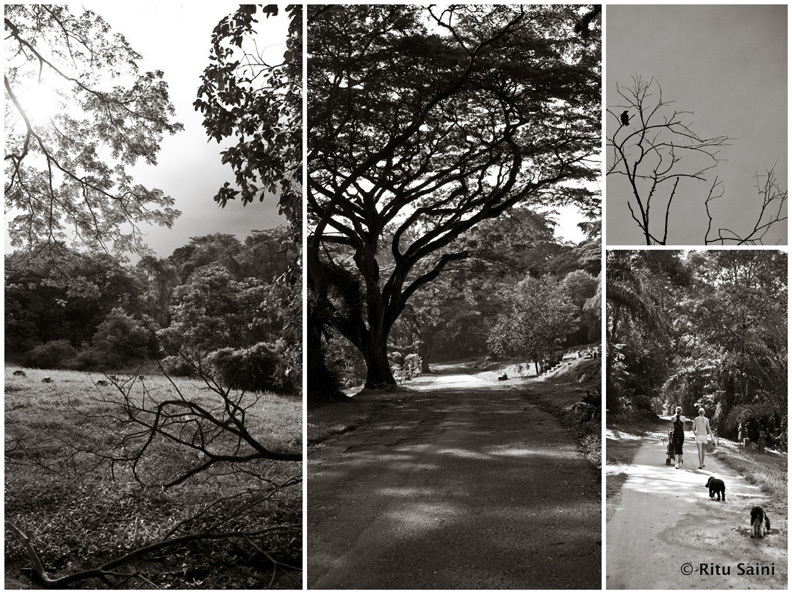 I’m glad to hear that Bukit Brown will also be kept as a heritage area for the future, but, what is happening to those who have been/will be exhumed? Great pix. Liked. Thanks 🙂 Yes it’s a beautiful contemplative place, and I hope it remains that way! What an exquisite and interesting place that I wish I’d known about when I visited Singapore. I hope the majority of the cemetery is preserved. 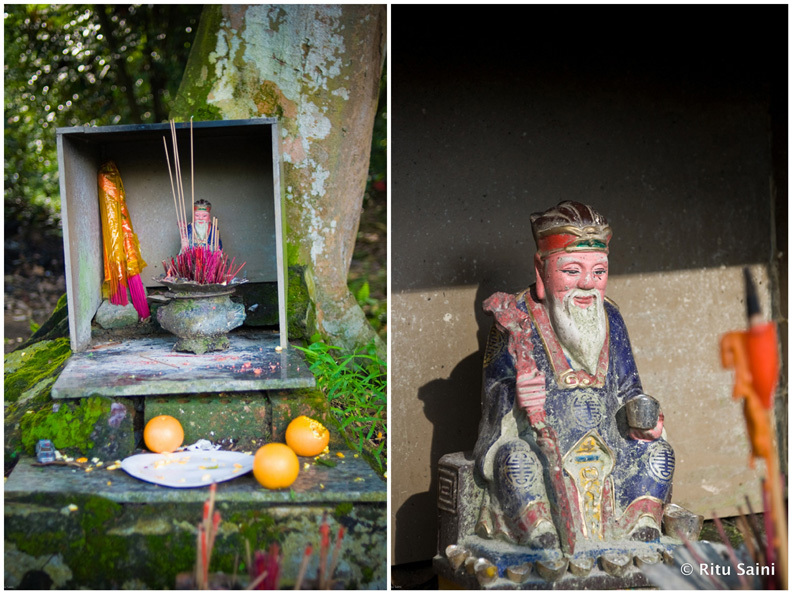 Great photos of the tombs and offerings! Thanks Lucy! It’s quite a different place than all the other places I’ve seen in Singapore till now! It sounds like you’ve discovered a pocket of tranquility! These are really stunning photos, Ritu. 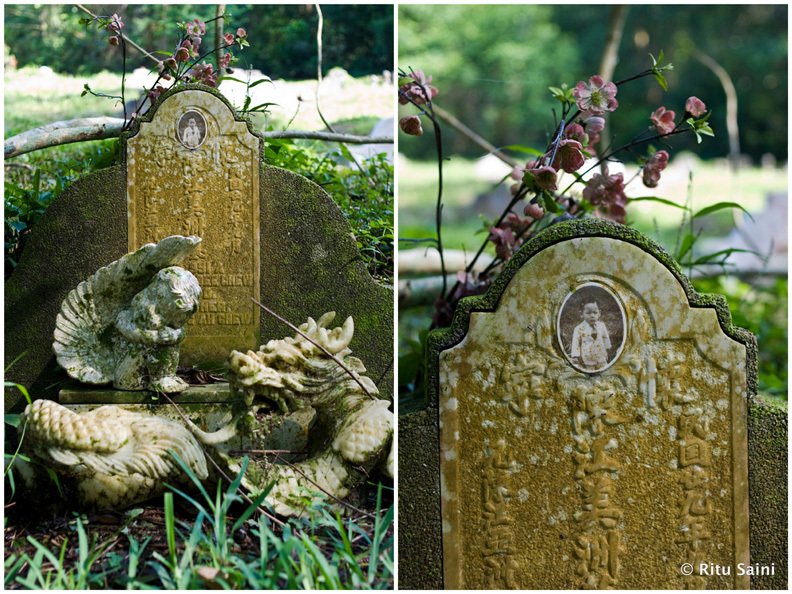 They make me want to catch a plane and fly straight to the Bukit Brown Cemetery to dwell in its wildness and history. I also like the way you have arranged your pictures, my compliments. Thanks a lot Marion 🙂 Am glad you like my blog and the pictures. You must visit Singapore if haven’t already! I love the way you have mentioned all the lil lil things about the place… I feel like visiting it !